September is coming to an end (whaat? ), so I thought it was about time I start on my fall porch! I’ve been putting it off because I have so many other ‘in-progress’ projects to finish… but those are taking way too long so I decided to switch directions for a bit. All it took was one nap time and now I have a new fall wreath adorning my front door. I absolutely fell in love with these Drop Cloth Pumpkins by Lucy from Craftberry Bush. I loved the neutral tones and the fact that they look so elegant but festive at the same time. Her pumpkins were the inspiration I needed for my fabric pumpkin wreath this year! I made the pumpkins out of pieces of left over fabric scraps from various projects and stuffed them with pillow stuffing. 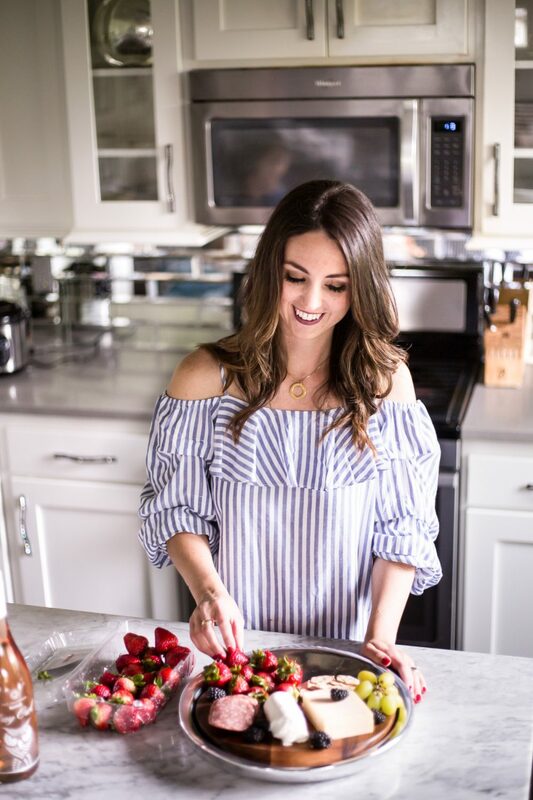 Lucy shows you how to make them here, they are so simple! I wrapped a straw wreath in white fabric and then added jute embellishment for some extra detail. You can view the completed fall porch here. I LOVE your wreath – it is so soft and beautiful in those non-traditional Fall colors!! Taryn, I love this wreath! You are so creative and always think outside of the box! Great job! Taryn this is simple and perfect! I love it, I really do- great job! darling!! 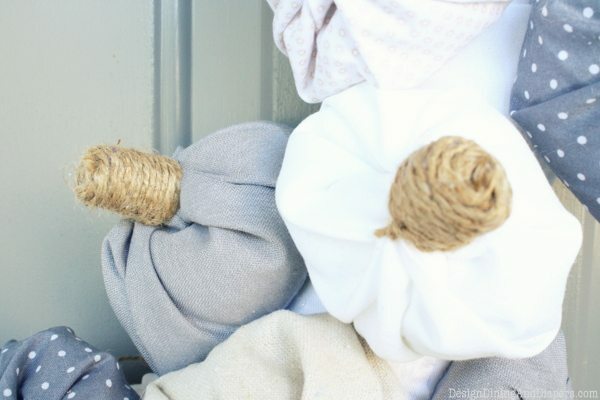 I love the twine wrapped around in that pattern, you are so creative! This is so simple and so elegant… right up my alley! Love it. How did you use fabric to wrap aorund with out having the raw edges? So pretty and timeless. 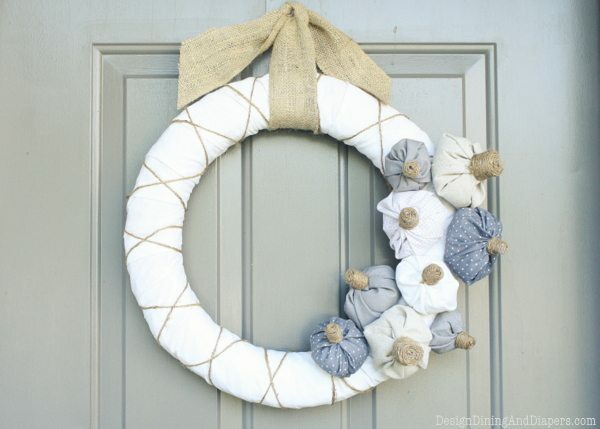 I’m quite often drawn to bright colors, but the softness of this wreath is so calming. Thanks for a fun party, Taryn! I love your fall wreath. So clean and elegant! Love your fabric choices- came out great! So pretty, Taryn! I love it. 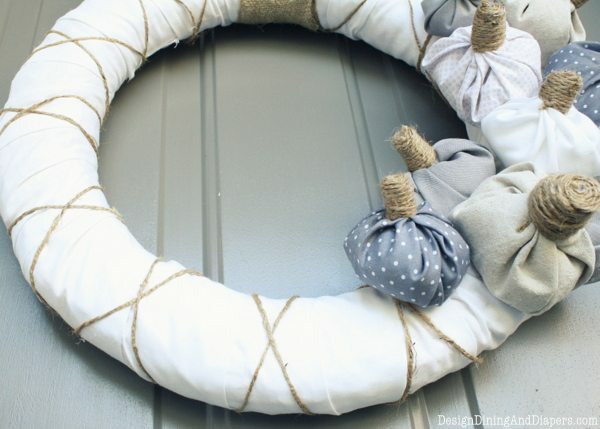 I’ve pinned to my wreaths board! Beautiful wreath! I wouldn’t have thought to use those colors but I LOVE the way it turned out! Adorable. The colors are great! So sweet, Taryn! Love the little pumpkins and the color scheme! Beautiful. Pinning. My weekly linky party–One Creative Weekend–has gone spooky this week in honor of my thirteenth party. If you haven’t already, I hope you’ll visit “One Creative Weekend” on OneCreativeMommy.com (open every Fri-Wed) and link up this idea and anything else you’d like to share. (You can include non-Halloween posts as well, but feel free to link up as many Halloween-themed posts as you like.) There are two categories—one for Halloween and one for everything else. This is goregous!!! I love everything about it!!! I like that you went with the light greys and blues… I think it is perfect!!! I also like how criss crossed the twine. Nice touch! I’d love for you to share this at my linky party at http://www.therusticpig.com Hugs!! So pretty!!! You need to share this on the CSI Project this week! I am going to share on the FB page. I really like your wreath! What a fun way to decorate for fall! And what a great addition to my front door! Hey there Taryn! 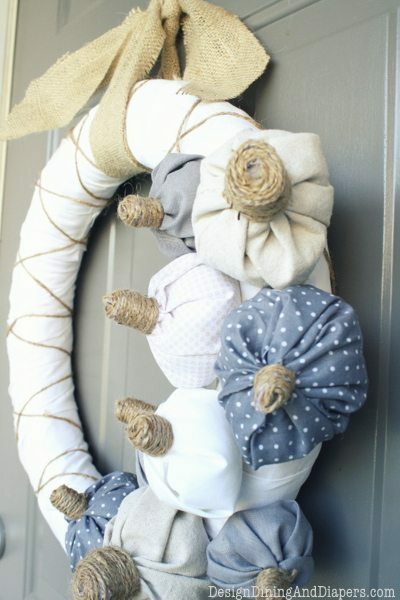 I jusdt shared your amazing wreath on my blog as a “Fiday Fave Pin”. I hope you will come and check it out!! I love wreath’s right now. Ok maybe a tad obsessed! I love all the little details….I’ll have it on my FB. LOVE this! You inspired my version (http://623designs.tumblr.com/post/33770276246/fall-fabric-wreath). It’s so cute,I’m tempted to move it inside so I can see it all the time. Hey Taryn, I love this wreath! so pretty. 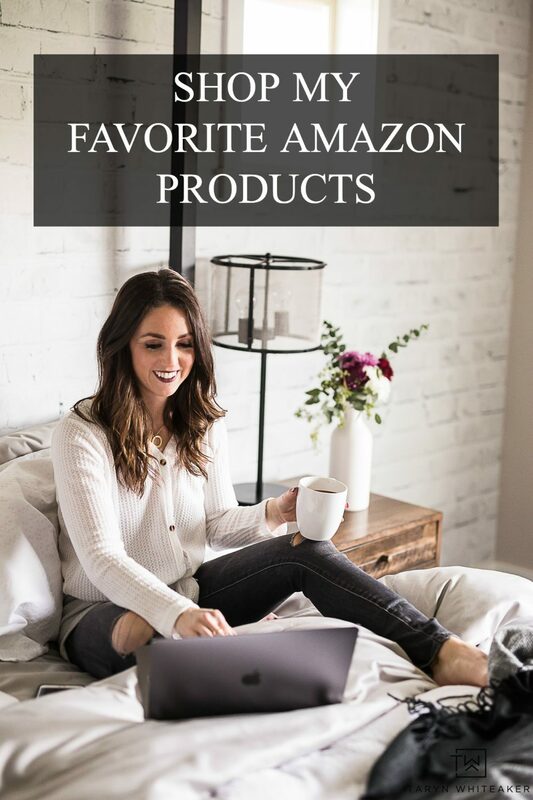 I think i’ve invited you before, but we just started back up our link parties and we would love if you came and linked up at The Humble Brag. Each week, one lucky featured blogger will get one free week of advertising, which mean thousands of ad views a day! Hope to see you there. I love this! my favorite type of style and look is rustic, shabby/chic and neutral. To me its so beautiful! great job. 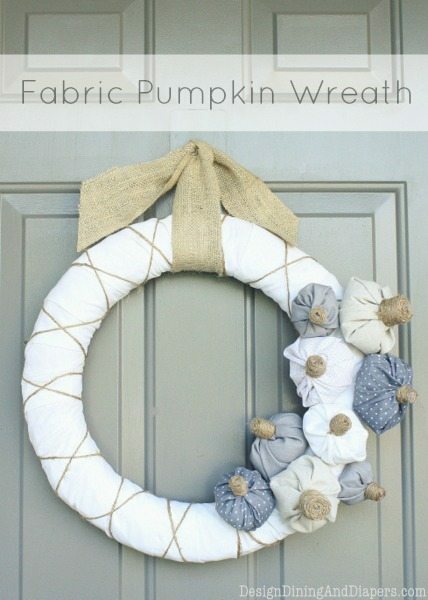 I kind of want to make a similar wreath but maybe with flowers instead of pumpkins since its not fall at the moment. awesome job!